In The Fast Lane is a book for those of us trying – sometimes failing – to keep all the juggling balls in the air! This family saga offers a glimpse of modern life in the ‘posh’ part of London, revealing both the craziness and triviality of life ‘in the fast lane’. Lotte Moore vividly weaves a complex web of family life between adult siblings Serena, Vivi and Jonty, and the matriarch – Beady. Serena runs a high-end interior design business for the West London elite, while husband Lang is entangled in corruption in his high-flying City job. Vivi is a therapist with serious doubts about her marriage to Theo, an internationally-renowned concert pianist. Only their brother, Jonty, seems to have found a happy balance – outside of the inner city fast lane – as a forester in Oxfordshire, with his wife Cheryl running a riding school for the disabled. Their mother, Beady, finds an unexpected new role as the cornerstone of the family, particularly for her grown-up children, who depend on her both financially and emotionally when catastrophe strikes. In The Fast Lane, written by prolific 82-year-old author Lotte Moore is an emotional, moving portrait of the surprising benefits of suddenly being needed again in old age. Lotte Moore is the best-selling author of Lotte’s War, which reached number one in the charts after its release on Remembrance Day 2016. 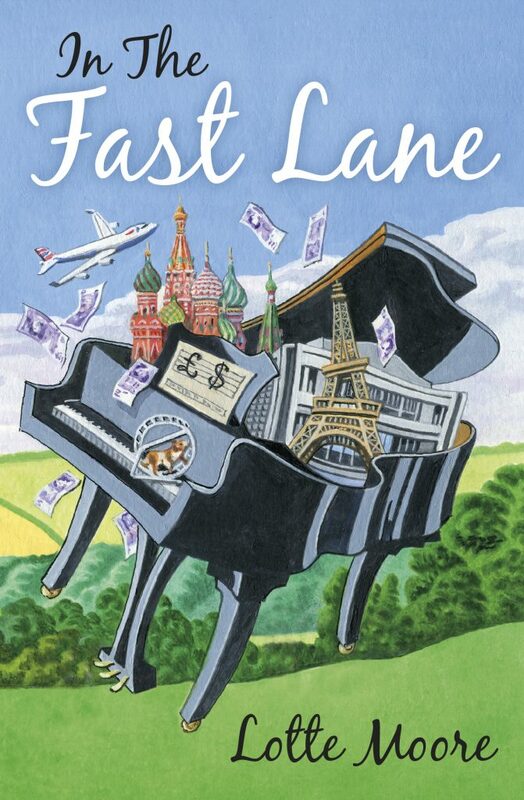 Perhaps best known for her children’s books, Lotte is looking forward to publishing her first novel, In The Fast Lane, under the Hashtag Press banner in May 2018. Lotte has written more than 25 published books but only started writing aged 70. Now aged 82, Lotte has written a story that will resonate with every parent who has struggled with juggling family life, parental responsibilities, work and career, children and a social life in today’s fast-paced world. Lotte dedicates her time, freely, every week, to read her stories to children in pre-schools and primary schools, and she’s always particularly busy around World Book Day (1st March). Having grown up during World War Two, she has seen and experienced a lot in life, and continues to build fictional characters and worlds that reflect what is happening right now… As a child, Lotte lived in Kent with her parents who enjoyed entertaining, political debate and literary discussion with the likes of Charlie Chaplin, Winston Churchill, H E Bates, W H Auden and Benjamin Britten. She was often lonely and turned to writing (stories, diary, poems and letters) to express her feelings of isolation. In her early teens, her commitment turned to ballet, point shoes replaced the pen. She was selected by the Royal Ballet School to dance in the Opera Ballet. When rejected for growing ‘too tall’ Lotte turned to acting and intermittently to writing. She finally married aged 38 to her loyal husband Chris (who continues to support Lotte by typing out her hand-written stories). Lotte became immersed in her stepchildren and then her own two girls. When her daughters left home she describes “empty years” filled by illness and family problems, and she turned to writing once again. Netgalley – While reading this I have the strangest sense of deja vu. Could it be possible that I may have read this book when it was originally published back in 2015? Definitely possible – It has everything I love – Fluffy British characters who are shallower than a kiddie pool, the idea of moving from the hustle and bustle of the city to the country (whether you want to or not!) and a pushy, annoying mother. (Serena, Vivi and Beady). If I did – well it was just as adorable the second time around! Amazon – A glimpse of modern life in posh London showing the folly and banality of life ‘in the fast lane’. Lotte Moore vividly evokes the complex web of family life between adult siblings Serena, Vivi and Jonty, and the beady-eyed matriarch, their mother Beady. Serena runs a luxury interior decorating company for the Kensington elite, while husband Lang is secretly embroiled in corruption in his City job. Her sister Vivi is a therapist in Chiswick but feels insecure in her marriage to Theo, a high-flying concert pianist, due to his constant tours to Russia with his ever-present manager, Sergei. Only their brother Jonty seems content, as a forester in Oxfordshire, with his wife Cheryl running a riding school for the disabled. Their mother Beady finds an unexpected new role as lynch pin to her grown-up children, financially and emotionally when tragedy strikes. A moving portrait of the surprising benefits of suddenly being needed again in old age. Amazon – A wonderful read with lots of twists and turns. A must read for summer. After reading ‘Marvellous Mavis’, another book by Lotte Moore, I was not disappointed in this book depicting Life in the hectic and chaotic times most of us live in. A charming Lady writes another fantastic read – I owe her a pint! This is such a good read and evoked many feelings and emotions. Lotte is a wonderful descriptive writer that brings the characters to life. It is thought provoking and writing that holds the reader spellbound. Highly recommended. A lovely book to become absorbed in. I loved it! This gives you the ‘feel good’ factor that we all need! So much fun. I adore Lotte’s writing and have read all her books… they always make me feel “on top of the world”! Lottie has inspired me over the past 20 years and thanks to her I now write myself. Searing and recognisable truths in this book!